1. 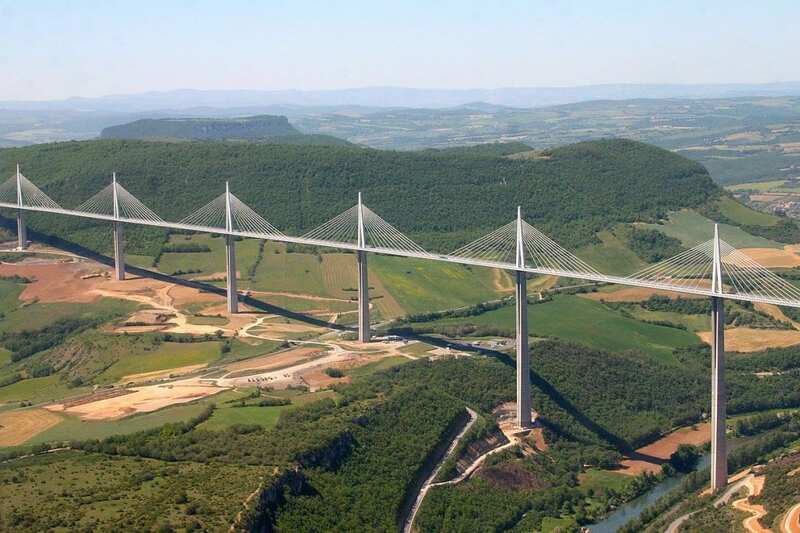 Millau Viaduct, France – 343 meters (1,125 ft) tall. Opened in 2004, this 4 lanes bridge is a cable-stayed bridge that spans the valley of the River Tarn near Millau in southern France. The bridge has 7 piers of different heights. The second one is the tallest with a height of 244.96 m (803 ft 8 in) – making it the tallest structure in France, taller than the Eiffel Tower! 2. Russky Bridge, Russia – 320.9 meters (1,053 ft) tall. Located in Vladivostok, the bridge was completed in 2012. It connects the mainland part of the city with Russky Island. 3. Sutong Bridge, China – 306 metres (1,004 ft) tall. Opened in 2008, this bridge spans the Yangtze River between Nantong and Changshu. 4. Akashi-Kaikyo Bridge, Japan – 298.3 metres (979 ft) tall. This beautiful suspension bridge was opened in 1998. It links the city of Kobe on the mainland of Honshu to Iwaya on Awaji Island. It is the tallest suspension bridge in the world. 5. Stonecutters Bridge, Hong Kong – 298 meters (978 ft) tall. A high-level cable-stayed bridge which spans the Rambler Channel in Hong Kong, connecting Nam Wan Kok, Tsing Yi Island and Stonecutters Island. The bridge deck was completed and opened to the public in 2009. 6. Yi Sun-sin Bridge, South Korea – 270 meters (890 ft) tall. Except of being the 6th tallest bridge in the world, it’s also the second tallest suspension bridge in the world and the fourth longest suspension bridge in the world. 7. Jingyue Bridge, China – 265 meters (869 ft) tall. This cable-stayed bridge in Jianli County was opened in 2010 and crosses the Yangtze River. 8. Great Belt East Bridge, Denmark – 254 meters (833 ft) tall. Opened in 1998, this bridge runs between the Danish islands of Zealand and Funen. It is the third tallest bridge in Europe. 9. Zhongxian Huyu Expressway Bridge, China – 247.5 metres (812 ft) tall. Completed in 2010, this bridge crosses the Yangtze River in Zhong County. 10. Jiujiang Fuyin Expressway Bridge, China – 244.3 meters (802 ft) tall. A Cable-stayed bridge under construction and should be completed by the end of 2013. With a main span of 818 m (2,684 ft), it will become one of the longest cable-stayed bridges in the world upon its completion.